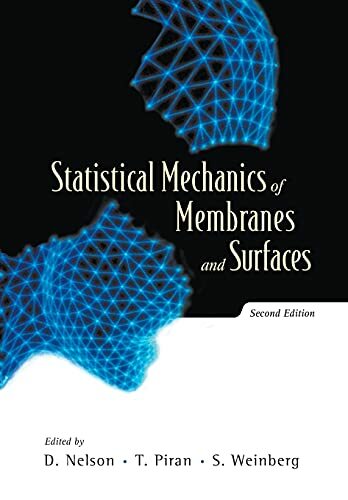 [PDF] Statistical Mechanics of Membranes and Surfaces (Second Edition) | Free eBooks Download - EBOOKEE! Description: This invaluable book explores the delicate interplay between geometry and statistical mechanics in materials such as microemulsions, wetting and growth interfaces, bulk lyotropic liquid crystals, chalcogenide glasses and sheet polymers, using tools from the fields of polymer physics, differential geometry, field theory and critical phenomena. Several chapters have been updated relative to the classic 1989 edition. Moreover, there are now three entirely new chapters - on effects of anisotropy and heterogeneity, on fixed connectivity membranes and on triangulated surface models of fluctuating membranes. No comments for "[PDF] Statistical Mechanics of Membranes and Surfaces (Second Edition)".